The volcano knows I am hot and tired. And it knows I am afraid. This grumbling thing, spewing smoke thick as winter fog, its sulfurous gases stinging my eyes and burning my nose. But it knows too, that in spite of my fear, I am drawn to follow the path scarred into the gray rock by its ancient molten lava, behind us clouds hanging low over the valley, ahead a steep incline to its fiery lip. But I’m getting ahead of myself. I didn’t start out so determined. But look at it there in the distance. Mount Bromo. How could a person resist walking across the Lautan Pasir, that ‘Sea of Sand’ stretching from its base? The cauldron- like expanse contains a number of active and dead volcanic mountains, only a few jeep tracks and scrubby shrubs to break it up. The volcano wizards stop tourists at the nearby mountain village of Cemoro Lawang if the science says an eruption is imminent. Or so we’re told. But my sister and I, self-described intrepid Canadian dorks, see only Tenggerese horsemen with their small hardy mounts offering us a ride we must surely want. And jeep owners peering seductively over their knockoff Ray-bans tempting us to roar off with them. Not easily seduced by men in balaclavas (protection from the sulfur and dust), we choose the forty-five minute walk. Down the steep grade of a hill shaded by jungle trees, down and down and out onto the sun-baked lava sea where a lone man schilling peanuts and lizard-skinned salak fruit makes his way toward us, smiling broadly and encouraging us to buy his wares. Wilma dubs him the Bedouin peanut man, and we walk, our clothes and skin darkening with the fine ash kicked up by an increasing wind. The salak is a surprising blend; firm like apple, sweet like coconut. It’s hard to describe such a place. Desolate, beautiful, stark, impressive; a scene of intensity, a record of the power of the elements. There’s a reason the volcano is considered a god to many Javanese who still make annual pilgrimages to throw offerings of flowers, and rice, plastic garlands and hand written poems into the mouth of the beast. And no mistake, Bromo sounds like a beast. As we approach its base, the low grumbling becomes a freight train’s roar, now distant, now near, a great belching and then a murmur. Alive. And perhaps not too happy about it. It gives us pause, but we are here, we can’t stop, the last thirty meters an incline so steep we haul ourselves up by clinging to a handrail built alongside stone steps slippery with years of ash and feet. And the summit. A small rail reaches only to the knees, one slip and we’d tumble into the yellow crater, its mouth an abyss deep into the earth. I am stunned out of fear by its raw beauty; the power, the sound, the force of it. But somehow, despite all its intensity, it no longer feels malevolent. Looking down into the bowels of the earth, I recognize Mount Bromo has no agenda, no desires, no need for our adoration or worhsip. It just is. And I am. Puny beside its growling immensity, but less afraid because none of it is personal. It knows nothing of me, cares less. I am simply irrelevant, a fact that becomes strangely comforting, instantly humbling. And that, perhaps, is the only thing both the volcano and I will ever need to know. In the summer of 2016 I traveled to Indonesia to research a novel, and found my dad’s dead brother. His name was Peter Hubertus Groenen back when he was a kid in Holland. Then the Franciscans got hold of him and he became Father Cletus, renowned Dutch theologian, linguist and teacher who dedicated himself to the people of Indonesia, the country in which he would finish out his years. Back in the ‘60s when he was translating the bible into the now obsolete traditional languages of West Java, I’ll bet Uncle Cletus never thought his Catholic soul would end up resting alongside Buddhist and Hindu, Muslim and Protestant, a sprinkling of the faithful sharing this earthly soil. I met Uncle Cletus when I was a child. He’d come to see the life my dad was carving out for his family in far-off Canada. But he seemed mostly bewildered by our house of seven girls and women, the place strewn with female paraphernalia we didn’t recognize as making anyone uncomfortable. Uncle Cletus did try. Bought me a ‘Winnie the Pooh’ piano book. My parents had suggested I was musical, but neglected to say I had only a chord organ and no lessons. Full-scale Pooh concertos were akin to hieroglyphs. But you have to appreciate someone who would try like that. His efforts made it so much worse that I thought he was a freak. There he stood at the altar in my Canadian church, tall and hungry-looking with pious prayer hands, narrow face dwarfed by enormous square- framed glasses, earth-brown robe cinched at the waist by a corded white rope, and sandals on his feet. Quite a sight in our little prairie church. He stood alongside our regular Canadian priest who wore normal white robes and proper leather shoes. And me all of ten, painfully aware of the reaction of my friends; they all thought the guy was a nut job. He was, in his way; worked himself nearly to death writing theological treatise about the West’s responsibility to help the poor and suffering of the Indies, while translating the bible for people who within a decade would mostly abandon it for the Koran. The man barely ate, smoked like a steamer and wandered with his head firmly entrenched in contemplation of the big questions. Impatient with human weakness and its manifestation in the world, he was a bit of a radical, and his students loved him for it. Not a nut job then; only eccentric. Forty years after that visit, I found myself on a quest to find his grave. My dad knew I was headed to Indonesia to do research, but suggested I might look for the grave, take a photo. He knew his brother was buried in Depok, a commuter city south of Jakarta. I would be nearby, perhaps I could make time? Dad cocked his 92 year old head of thinning white hair, searching my face with cataract- tinged blue eyes as he leaned more heavily into his cane. He knows how to get what he wants. The first days of the trip were spent navigating the crazy stew of Jakarta where remnants of colonial grandeur compete with nose clogging pollution that hangs over sludge filled canals. Skyscrapers and Gucci outlets tower over tin- clad shacks clustered on streets laced with eight inch deep gutters running with sewage and plump rats. Incongruous. Fascinating. Jordi, my bed and breakfast host, lives as a Christian in a largely Islamic nation. Intrigued by the story of Uncle Cletus, he thought a moment, and called Mister Zul. Zul arrived driving a small black SUV and wearing a plaid shirt and jeans, small wire reading glasses perched on his wide nose. Tall and gregarious, good humour sparkled in Zul’s eye as he assured me that we could easily detour through Depok on the way to Bandung. He would find my uncle. I had no idea what I was asking. And if he knew what he was getting into, he didn’t let on as he loaded my bags and introduced his wife. A darkly beautiful woman with wide set eyes, Fatil was stylish and perfectly coiffed. In the backseat, my sweat- wrinkled menopausal self, watched in awe as the couple up front held hands, smiling fondly at one another and conversing quietly in Bahasa Indonesia when they weren’t pointing out the sights in perfect English. It turned out the whole of Java was on the road, off to celebrate the end of Ramadan with relatives. Two lanes of traffic become four with motorbikes and becek taxis dodging between cars and pedestrians hoisting baskets and bags. Hawkers added to the mayhem, selling everything from deep-fried noodle balls to wood carvings of long red chilies with an uncomfortable resemblance to spicy dildos. Depok is about 50 kilometers from Jakarta. It took two hours to get there. When Uncle Cletus died in Depok twenty-five years ago it was a small city. Today’s population is almost two million. And all we had was a name. I learned something about the Javanese that day – they will go to any length to ensure that what one is promised is delivered, even if the promise is virtually un-deliverable. Fatil punched away at her cell phone and Google maps delivered three potential locations. Like men everywhere Zul questioned his wife’s veracity, trusting instead a skinny man in undershorts pouring water over his head from a makeshift bucket shower. The man in undershorts did direct us to a Catholic cemetery where a fully-clothed fat man sat in the shade watching over a tumble of tombstones of assorted shapes and colours. Verdant green fronds of things waved from between their crumbling stone edges. Catholics, yes. Priests, no. Undershorts man was wrong. And Fatil was right. Hadn’t she said so? She punched Zul lightly on the arm as we maneuvered back to a main thoroughfare and found our way. Whether optimistic or delusional, Zul navigated his SUV through streets so narrow you couldn’t open a door without hitting a house, and around corners so tight he was forced to back blindly out of them inches at a time. Three cemeteries, a lot of driving, asking and wandering, and we were stumped, tired and hot. I tried not to picture my dad’s disappointment. What I didn’t expect was Zul and Fatil’s. “One more try,” they said. I breathed deep; one more try. But first, lunch. The SUV snaked its way to a restaurant where Fatil hurried away. “She wants to pray.” Zul waved toward his wife who pulled a taupe headscarf from her purse and disappeared into a mushola, the prayer rooms of every size and shape found across Java. “I’m more of an atheist,” he said, putting yet another cigarette to his lips and wandering off to smoke. I hadn’t thought what Fatil’s faith might be. Ninety-eight percent claim Islam as their religion, but Indonesia is a secular country and its women evince wholly independent expressions of their faith; from buttoned right up, to jeans with a headscarf, to those impossible to differentiate from a baptized and back-slid Canadian Catholic. The whole of Indonesian culture is infused with centuries of fragmented traditions. And their faiths are as well; a Hindu might set out offerings to ward off black magic, a Muslim burn incense as homage to local spirits, or a Christian consult a shaman. Looking out from the restaurant patio at a volcano puffing over the fog-filled valley, I thought Uncle Cletus would be happy with this melding. Despite years of work, he’d willingly given up on Catholic translations of the bible to make way for a kind of ecumenical cooperation. My dad always said his brother’s deepest calling was to enhance the dignity of the person and to foster peace. It seemed to me the babel of language and tradition and religion I saw in West Java was a kind of cultural ecumenicalism of which he would approve. Fatil’s prayer over, we ate a lunch of sambal-flamed bakso ayam soup tempered by sticky rice and were on our way. One more try. Up and away on a mountain plateau edged by jungle, we drove into a cemetery stretching far as the eye could see, arched green trellises gracing the entrance to each section. Catholic, Buddhist, Protestant, Muslim. Organized. Neat. Tall teak trees shaded small flowered shrubs, bamboo thickets whispering in the wind. Peaceful and green and lovely. A rope- thin old man in flip-flops and crushed ball cap led us down wide shaded paths, stopping to point reverently at a dozen graves in a walled corner. And there it was. In a fateful vortex, the 17,000 islands of the Indonesian archipelago whorled in toward this one island, Java, with its press of millions, to this cemetery of a few hundred departed souls, to this one grave. His life was a droplet in the spray of Indonesia’s long and sometimes sordid history, but my Uncle Cletus’ work and life obviously mattered to whoever laid him to rest in that lovely shaded spot, his grave framed and adorned with polished black marble and white rock. Note the name should read Pieter Hubertus. With help from Christian, atheist, and Muslim, a Canadian woman found the grave of a Dutch Franciscan in the heart of Islam. Who would have thought? Each body there was buried according to religion, but in that moment I imagined their souls woven together into the Indonesian fabric, a common blend of culture and tradition and faith. I pictured them answering the muezzin’s call or the church bell, the smell of incense or a mudras gesture, the dead released from their segregation to share a drink and shake their heads at the foibles of the living. And my Uncle Cletus wandering happily amongst them. Zul hugged me hard. The tears in his eyes were real as my own. Unable to speak, I could only nod in gratitude for his efforts. When my vision cleared, I took a picture of the grave to carry home to my dad, proof that his brother rests easy. Author alazurkoPosted on May 26, 2018 Format ImageCategories UncategorizedLeave a comment on Proud to be a contributor to this! Wes Olson pokes the spaces between the rocks on the grassy hillside, checking for rattlesnakes, before letting us sit down. With that potential threat out of the way, he warns us about the bison. There are a few standing a good half mile away and the massive beasts are not likely to run you down for no good reason. But Wes tells us a good rule of thumb, literally, is to hold that digit out in front of you, look at it through one eye, and if any bison parts are visible on either side of your thumb, YOU ARE TOO CLOSE! Bison are deceptively fast, and given their size, well you just don’t want to be in the way. He looks like his name sounds. Wes Olson: tall, rugged, sun-baked and mustached. I suppose that could also describe an outlaw, but his quiet and intelligent confidence speak to a character comfortable in his own skin and his own knowledge, and mostly at home in the nature that surrounds him. He is very, very wise and speaks of the bison as an elder might, with wisdom and grace. 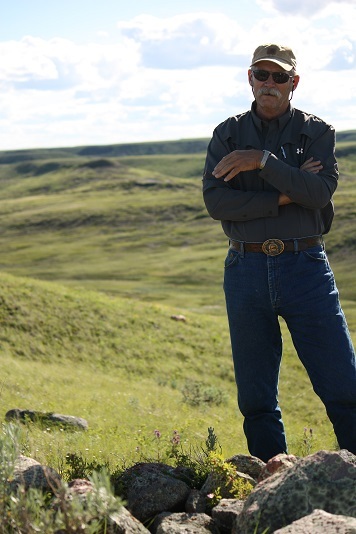 I have a sense that if he were to get a chance to actually talk to the politicians who decided not to replace him when he retired from Grasslands National Park in 2012, he would simply shake his head in wonder at the ignorance of humankind. Because Wes knows bison. After thirty years of working with these ungulates in various parks across Canada, he’s come to understand and admire the bison in a way only someone truly in tune with them can. Their mating rituals; how their habit of constantly moving while grazing maintains native prairie grasses; how a bison’s skeletal structure supports its massive head and chest while giving it lightning speed; the ways in which bison manure supports dung beetles which in turn support bird species; that bison hair is the second warmest fibre in North America and is also water repellant; how the unique olfactory masking of this hair used in bird nests enhances chick survival from predators. 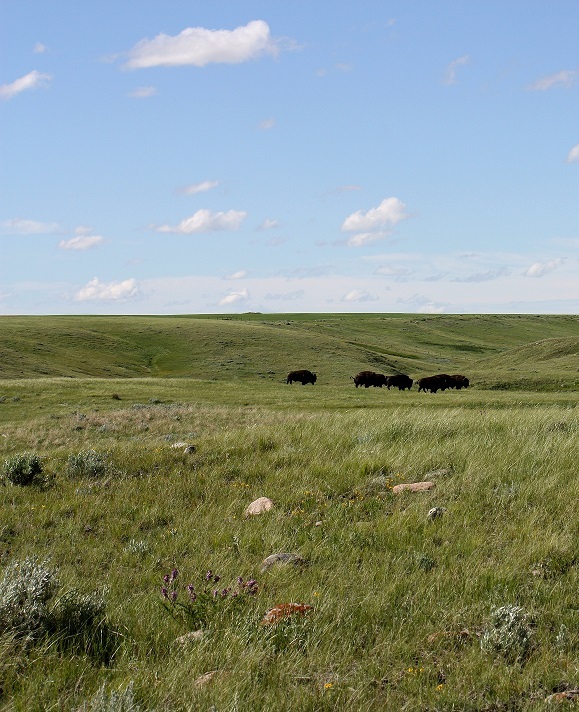 These are just a few of the facts he shares with our eclectic group which includes authors, ranchers, scientists, and environmentalists, all interested in preserving grasslands and the species they support both within and outside the park. Along with other senior staff in the park, the position Wes left was not filled. He has no one to pass his wisdom to, no one to care, in a single-minded way, about the bison which were re-introduced to the park in 2006. At that point there were 71 bison. In 2013 the total numbers were at 344, according to Wes. 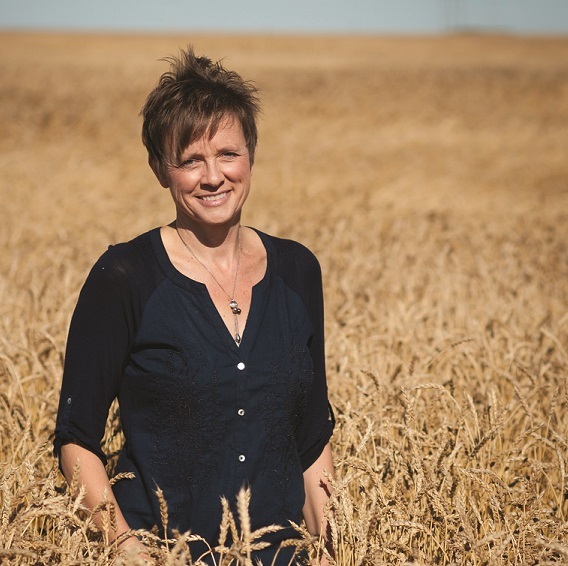 The objective was to hit 350 and study their effect on the native grasses in the park, how their grazing habits might help sustain pristine native prairie that is vital habitat to a multitude of species-at-risk. But this year there will be few park staff to watch, to count or to care. Grasslands is a long way from anywhere. It’s one of few dark sky preserves in the world. It’s a huge expanse of hills and draws covered in grasses and shrubs and lichens and wildflowers whose numbers I can’t begin to count. There are more than 12,000 archeological sites in the area, including teepee rings, effigies and burial sites. It is wondrous place, impossible, really, to comprehend. But that’s the point. It is only when you look out over the vista and then get up close and personal with the bison through the knowledge Wes offers, that somehow you too can feel it, just a little. A sense of history that remains little marked by the present, a feeling that here we have something awesome in the truest sense of that over-used word, a national treasure. Much as Wes Olson is. More than one of the group referred to him as such, their faces crumbling in despair at the thought his knowledge and skill will be lost. But apparently if you live in a place isolated by geography, a national treasure means little and the bison he watched over even less. 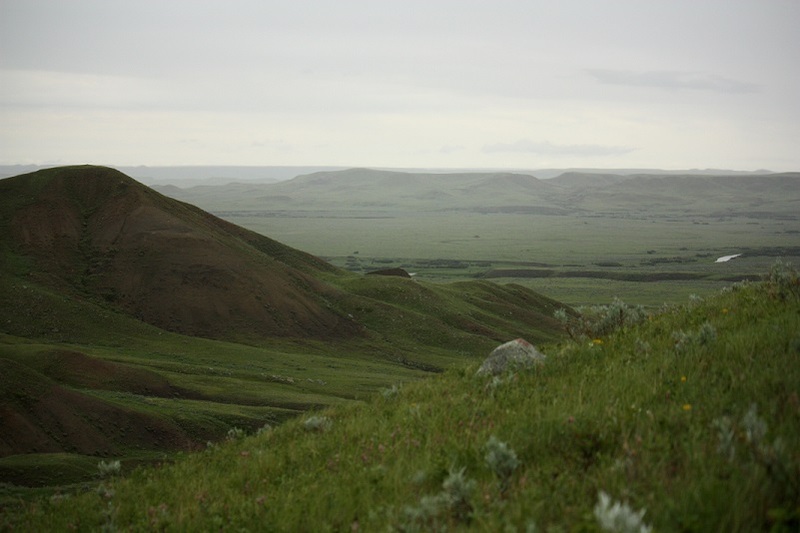 It is worth the trip to the grasslands of Southwest Saskatchewan to see and judge for yourself; see the animals, listen to the birds, touch the grasses and the flowers. They will make your heart sing. And when you’re inclined to dance to the rhythm, remember to let others know and to insist an apprentice is hired for Wes to mentor, and to understand that we are all responsible for the protection of those things worthy of preservation.